Not to be confused with Salcombe Regis, the Devon village near Sidmouth. For other uses, see Salcombe (disambiguation). Salcombe is a popular resort town in the South Hams district of Devon, south west England. The town is close to the mouth of the Kingsbridge Estuary, mostly built on the steep west side of the estuary. It lies within the South Devon Area of Outstanding Natural Beauty (AONB). The town's extensive waterfront and the naturally sheltered harbour formed by the estuary gave rise to its success as a boat and shipbuilding and sailing port and, in modern times, tourism especially in the form of pleasure sailing and yachting. The town is also home to a traditional shellfish fishing industry. The town is part of the electoral ward of Salcombe and Malborough, for which the 2011 census recorded a total population of 3,353. Kingsbridge Estuary (actually a ria or drowned valley) lies between Bolt Head and Sharpitor on the west and Portlemouth Down on the east, and runs inland for some 8.6 kilometres (5.3 mi). The estuary was designated a Site of Special Scientific Interest in February 1987 and is also a Local Nature Reserve. There are several shipwrecks off Salcombe. The oldest is of a Bronze Age ship, one of only three known in Britain, which had weapons and jewelry made in what is now France. The Salcombe Cannon Wreck is a 17th-century ship that contained 400 Moroccan gold coins and Dutch items. In 1936 a Finnish four-masted barque, Herzogin Cecilie ran aground on the Ham Stone and was subsequently beached at Starehole Bay, near Bolt Head. Also off Salcombe is HMS Untiring, a Second World War submarine sunk in 1957 as a sonar target. A description of the South Hams is given in the 9th century charter S298. This does not show Salcombe but its area is part of Badestone (Batson). "Salcombe" first appears in the records in 1244, on the boundaries of Batson and West Portlemouth (Portlemore Barton). In 1570, there were 56 mariners while two years later another survey shows five ships under 60 tons at Salcombe. During the English civil war the town sided with the Royalists and held out against the Roundheads. The ruins of Fort Charles remain towards the south of the town. It held out from January to May 1646 and was the last Royalist stronghold. This fort was built for Henry VIII to defend the estuary. It was slighted on the orders of Parliament. A turnpike road was built to Salcombe in 1824. Originally Salcombe was part of Malborough parish but a chapel-of-ease was built at Salcombe in 1401. The parish church was not built until the 19th century. The population of Salcombe was 972 in 1841, but had risen to about 1500 by 1850. There is also a Wesleyan Chapel and a Catholic church. During the Second World War a radar station was set up on Bolt Head and Salcombe became an Advance Amphibious Base for the United States Navy in September 1943. The Salcombe Hotel became the latter's headquarters and 60 other properties were requisitioned, as well as Quonset huts being built on the hill near the Rugby Club. Whitestrand Quay and slipway was constructed. 137 officers and 1793 men were based at Salcombe. 66 ships and many auxiliary vessels sailed from Salcombe on 4 June 1944 as part of "Force U" which landed on Utah Beach, Normandy. Afterwards Shadycombe Creek and Mill Bay were used to repair damaged landing craft. The base closed on 7 May 1945. A plaque was set up in Normandy Way to commemorate the United States Navy. Salcombe and district suffered a number of bombing raids during the war. There have been many changes to the Salcombe Waterfront since World War II, the most noticeable being the construction of the Creek car and boat park, and the road to Batson. Salcombe became an urban district following an Act of Parliament in 1972. The Pier and Harbour Order (Salcombe) Confirmation Act 1954 established the harbour as a statutory harbour under local authority ownership (i.e. a municipal port) and conferred powers on the urban district council of Salcombe (which was later to be incorporated into the South Hams District Council) to "authorize the Council to construct works to maintain manage and improve the said harbor and estuary and to levy tolls rates and charges and for other purposes." In 2014 the European Sea Ports Organisation awarded the harbour Eco-Port status. Towards the mouth of the estuary is the Bar, a spit of sand protruding from the east bank which is exposed at low spring tides. In this state of tide and with strong southerly winds the bar can make the entrance to the estuary dangerous. The moaning refers to the noise of the water breaking over The Bar. Salcombe Lifeboat Station was established by the Royal National Lifeboat Institution in 1869. In 1916 the Salcombe lifeboat, an open rowboat "The William and Emma", was capsized crossing The Bar resulting in 13 of the 15 crew's lives being lost. However another crew was soon formed and the station continues to this day. There is Tamar-class all-weather boat and an Atlantic 75 inshore boat. The original lifeboat station on South Sands is no longer used and there is a lifeboat museum and shop in Salcombe town, at the lifeboat station itself. Further into the estuary on the east side is a series of popular sandy beaches: Sunny Cove (nearest the bar), the large Mill Bay, Cable Cove (the landing point of a cross-channel cable), Small's Cove and Fisherman's Cove. Adjacent to Fisherman's Cove is a landing slip used by the ferry — open-topped clinker-built motorboats — from Salcombe directly across the estuary, communicating with the hamlet of East Portlemouth. From here there is access to the South West Coast Path. Opposite the Bar on the west side of the estuary are the beaches of South Sands and North Sands. A picturesque ferry operates between Salcombe and South Sands, with a Sea Tractor ferrying passengers between the boat and the South Sands beach. South Sands beach has been awarded the coveted Blue Flag Beach status for several years. The adjacent North Sands and Mill Bay beaches share the same high standards of cleanliness and water quality but have not sought the award because of cost considerations. Although Salcombe harbour hosts a small but active shell fishing fleet of approximately 20 boats (the largest of which is less than 20m in length) the harbour is primarily a recreational leisure port which accommodates approximately 1600 residential yachts and power vessels, and which welcomes around 6,000 visiting vessels a year (2015 figures). There are no commercial vessels which ply their trade in this harbour, predominantly because the Bar at the harbour entrance limits the maximum draught (and hence size) of visiting vessels. The estuary is a relatively sheltered body of water upon which a wide variety of marine pursuits take place: Standup Paddleboarding, kayaking, yacht and dinghy sailing and racing are popular activities, as is swimming from one of the many beaches within the estuary. The harbour has inspired its own class of dinghy known as the Salcombe Yawl. Salcombe Yacht Club hosts the Salcombe Yacht Club Regatta every August, attracting up to 400 dinghies in 10 or more dinghy classes plus handicap fleets. The Salcombe Yawls take pride of place as they were all designed and built in Salcombe using traditional boatbuilding techniques. The sailing regatta classes include: Fast & Asymmetric Handicap, RS200, Medium Handicap, Enterprise, Larks, Laser Standard, Laser Radial, Topper, Junior Handicap, National Twelve, Salcombe Yawls, Solos and Cruisers. The Salcombe Town Regatta and sailing regatta form a very popular and busy fortnight in Salcombe. The order in which they run switches each year and usually coincides with favourable tidal conditions for the various events. The Salcombe Town Regatta is the busiest week in the calendar year. Family friendly events include mud races, the cross harbour swim, fun-run, rowing races, swimming gala, sandcastle competition, fishing competition, water treasure hunt, land-based treasure hunt, spot the bloomer, crabbing competition, fireworks, Crabbers Race, torchlight procession, children's sports and family fun day, fancy dress parade and air displays. Occasionally the Red Arrows are booked to perform over the estuary. Due to its unspoilt beauty, sandy beaches and harbour facilitating sailing and yachting, Salcombe has one of the highest average property prices in the UK, soaring above Sandbanks, Poole in recent years. Many of the shops, bars and restaurants in the town, especially towards the waterfront, cater for a predominantly well-off, fashionable and nautically-inclined clientele, with prices to match. There are many clothes shops and art galleries. Salcombe has hotels and bed and breakfast establishments as well as self-contained apartments and houses which help its population soar from approximately 1900 in the winter months to nearly 25,000 during the height of the summer. Salcombe has a number of boatyards and marine stores, while boats are stored on the carpark by the fishing quay during the winter. There is a power boat school  and SCUBA diving is popular, although consent from the harbour office must first be obtained to ensure safety. The town and yacht club regatta weeks are one of the main features of the summer season. There are races for dingies and yachts as well as crabbers in addition to other activities. Salcombe Estuary Rowing Club is a member of the Cornish Pilot Gig Association and takes part in races around the south west. The Marine Hotel was bought in 2012 by the Harbour Hotel Group and transformed into the Salcombe Harbour Hotel at a reported cost of £12million. Fourteen villas and apartments were constructed in front of the refurbished hotel and sold off-plan in 2012-2014 at prices were from £1.2 to £2.85 million. Some villas are used exclusively by the owners and others are rented out as holiday lets. Stores include Fat Face, Joules, Musto, Henri Lloyd and White Stuff. Fashion brand Jack Wills was founded in 1999 at 22 Fore Street. Salcombe is also home to Cranches, the oldest sweetshop in Devon. The Salcombe Maritime Museum, founded in 1975, has information on the fruit schooners and other items of interest. Since 1991, the museum has occupied the ground floor of the former council offices. Temporary exhibitions are arranged each summer mainly with loaned items. By South Sands is Overbeck's a house and gardens belonging to the National Trust. In the house are inventions of Otto Overbeck. Salcombe has numerous walking routes nearby and is on the South West Coast Path. It is also on the National Cycle Network route 28 from Okehampton to Plymouth. A 20m outdoor heated swimming pool forms part of the Salcombe Primary School and is open year round. The rugby club is a centre of activities during the winter. Salcombe residents include Sir Clive Woodward, Kate Bush, Sir Michael Parkinson, members of Led Zeppelin. 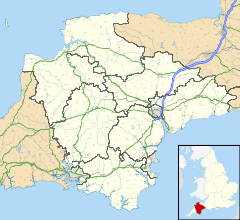 England Rugby prop Julian White who played mini-rugby and Under 16s for Salcombe was born in this area. Mary Berry has a holiday home in Salcombe. 2012. ^ "Salcombe & Marlborough ward 2011". Retrieved 20 February 2015. ^ "Experience Salcombe! - Salcombe Tourist Information & travel advice". ^ Leach, Nicholas (2009). Devon's Lifeboat Heritage. Chacewater: Twelveheads Press. pp. 21–25. ISBN 0-906294-72-X. ^ "History of the Atlantic Cable & Submarine Telegraphy - Cable Timeline". ^ "How Salcombe became one of the UK's most expensive real estate areas". ^ "Salcombe Powerboat School - Salcombe". ^ Historical Atlas of the South West. ^ "Official site". Salcombe Maritime Museum. Retrieved 9 March 2015.